So many people, young and old, have a special relationship with Disney and its beloved fairytale princesses. For almost a century now, Disney has enchanted young kids with their re-telling of timeless tales of magic and wonder through film. With characters who teach us to dream, love, hope, and stand up for what we is right, kids everywhere have learned to follow their hearts and to take destiny into their own hands. 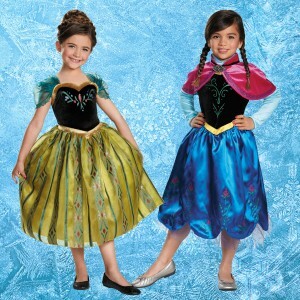 It’s no wonder that year after year, Disney princesses are always among the most popular Halloween costumes. 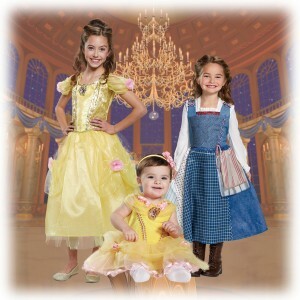 This year, why not dress up your little one as her favorite character so that she can become a princess for a night? Disney’s first full-length animated film Snow White has been a classic since its release in the late 1930s. Known as the fairest in all the land, Snow White enchanted audiences with her beauty, kindness and grace. 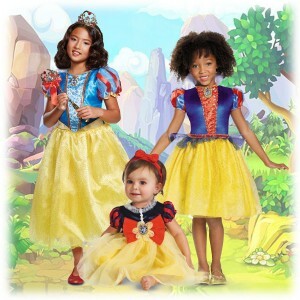 This year, your little girl can channel her glowing, generous spirit with the perfect Snow White costume. The princess who started out as a servant dreamed of a better life for herself, full of enchantment and wonder. She shows us that dreams can come true! With the help of her fairy godmother, a chance meeting with the Prince turned her whole world around. Pull together the gown, tiara and slippers to give your little girl the complete ensemble so she can feel just like a princess at the ball! Sleeping Beauty is a classic tale of good versus evil. Aurora is graceful, elegant, and kind while Maleficent is jealous and vindictive. With so many costumes from the classic Disney animated film as well as Disney’s Maleficent, there are so many ways to dress up as this beloved princess. The studious and remarkably beautiful Belle never quite fit in with her French provincial townspeople. Her courage led her to end up in a dark mansion with the Beast, who had shut out the world from his shocking exterior. With kindness, patience and an open mind, Belle taught the once proud and selfish prince that beauty is more than just skin deep. The ultimate gift was that of love, and your girl can also learn this important lesson as she transforms into the lovely and kind Princess Belle. As the exotic beauty of the bunch, Jasmine prized love above all else. Against her father’s wished, she sought to find love on her own terms. A run-in with a common thief was just the beginning in discovering that there’s more to a person than how society views them. 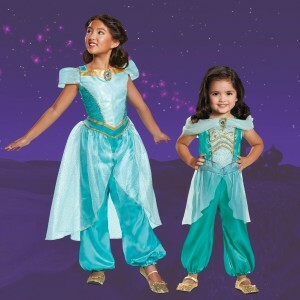 For the girl with the rebellious, free-hearted spirit, transforming into Princess Jasmine is the perfect way to inspire her to find her own way in the world. The ever dutiful daughter who couldn’t figure out her place in life, Mulan sought to bring honor to her family and her country the best way she knew how. In an effort to save her father’s life, she took his place in the war against the Huns and showed that girls can tough it out with the strongest of men too! 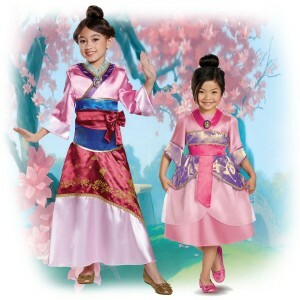 Your little girl might not save the world, but she’ll feel just as brave as her this Halloween in a Mulan costume. With a story for the new ages, Tiana worked hard to achieve her dreams and goals. All work and no play is no way to enjoy life, though! With the help of a frog prince, Tiana learned to balance life by taking the precious time to enjoy life’s small moments. 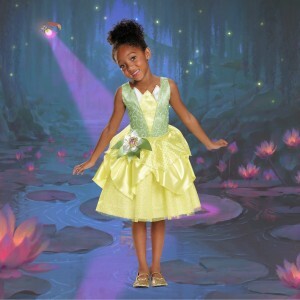 Dressing up as the ambitious Tiana this Halloween, your little girl can dream big and accomplish anything. The classic tale of Rapunzel sees this princess trapped in a tower until along comes a prince that rescues her. However, Disney’s Tangled puts an adventurous spin on things and portrays Rapunzel as quirky, determined, and spirited. Instead of having Flynn Rider rescue her, she lets him tag along as she sets off on her own journey. Your daughter can set off on her own journey too when she dresses up as this long-haired princess. Disney’s Brave shows us that you don’t have to fit into the proper-royal-lady mold to be a princess. Merida is stubborn and rebellious princess who loves adventures, riding horses, and archery. This red-headed free spirit teaches us to accept everyone for who they are and that family is forever. 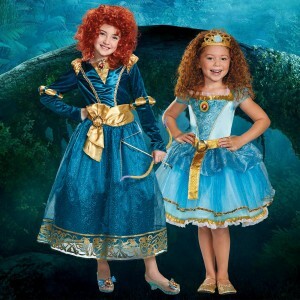 Now your little one can have her own great adventure when she puts on one of our amazing Merida costumes. Of the two Frozen sisters, Anna is the bright-eyed and optimistic one. She didn’t have any powers but her bravery and loyalty spurred her on to go on a dangerous journey to save her kingdom as well as her relationship with her sister. Your daughter can feel just as brave as Anna in any of our Frozen Anna costumes. Throughout her feature film, Elsa struggled with her powers and hiding who she was. She even kept her own sister at a distant so that Anna wouldn’t have to see the real her. Once Elsa finally decided to Let It Go, she was able to embrace who she was and find her place in the world. She even realized that her bond with her sister was the strongest power of all. 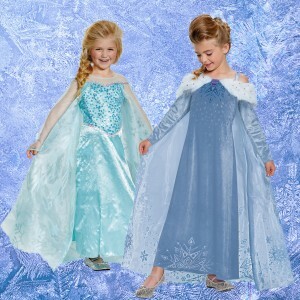 Once she dresses up as Elsa, your little one can sing Let It Go to her heart’s content. 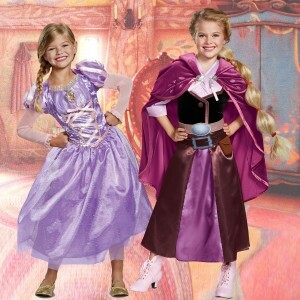 All these costumes and accessories make great gifts for any girl who wishes to live out her Disney princess dreams. Best of all, it’s a fun and educational gift that encourages social learning, which she’ll be able to use all year long! 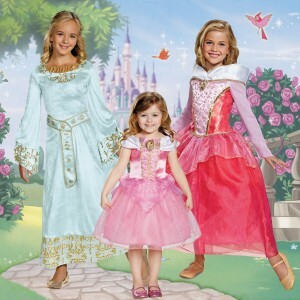 If you have an upcoming birthday party to attend, make a little girl’s wish come true and shop our entire selection of Disney Princess costumes to find the perfect gift. Until next time, dream big and love with all your heart!